This home was built for the Calthorpe family in 1927, the year the Federal Parliament and public service were transferred to Canberra. Harry and Dell Calthorpe moved to Canberra from Queanbeyan, having seen the potential of the new city first hand through Harry’s role in land auctions in the growing Federal Capital. The Calthorpes chose the architects Oakley and Parkes to design their home; the same firm that had won a national competition to design suitable houses for the Federal Capital, and had also designed the Prime Minister’s residence, the Lodge. The house was designed for the hot, dry Canberra summers and to correspond with the Garden City ideal of a free-standing cottage set within a large garden. 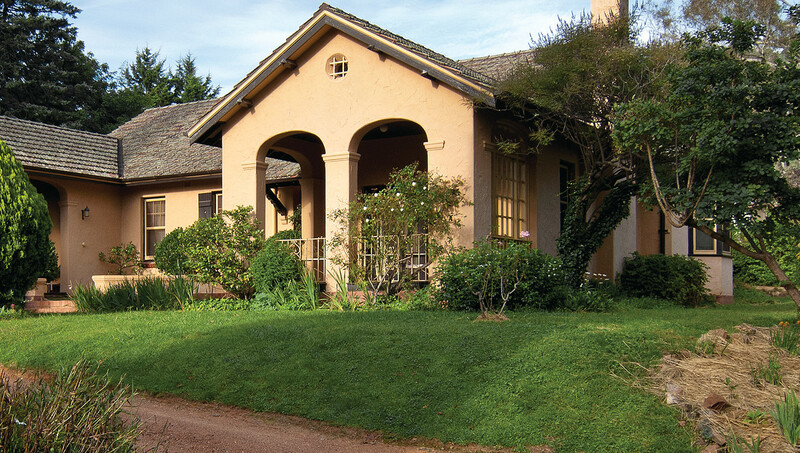 Like many Canberra houses of this period it has a roughcast exterior finish painted in earthy colours, a tiled roof with shingled gables, arched verandahs and shuttered windows. Adding to a few treasured items of furniture transferred from their old house, Mrs Calthorpe selected new furniture and household items from Beard Watson & Co. in Sydney. As most of the furnishings and fittings were purchased at the same time, and were carefully cared for by Mrs Calthorpe rather than being replaced, the house and its contents remain excellent examples of the prevailing style of the time. Harry Calthorpe was a partner in the stock, station and real estate agency of Woodgers and Calthorpe. The firm conducted the first sale of leases in Canberra in 1924. Harry had served in WW1, sustaining injuries at Gallipoli which saw him return to Australia to work in the recruiting campaign. Harry married Della Ludvigsen in 1917 and their two daughters, Del and Dawn, were born in Queanbeyan. The girls grew up alongside the new city of Canberra, attending the Church of England Girls’ Grammar School which was a short walk from their home. Del married Captain STG Coleman in 1942, and in 1944 Dawn married Douglas Waterhouse, an entomologist at the CSIRO where Dawn worked as a laboratory assistant. Harry Calthorpe died in 1950, and his wife Dell remained living in the house until shortly before her death in 1979. In the mid 1980s, as many in our community were becoming concerned about the loss of Canberra’s heritage, the Federal Government purchased Calthorpes’ House. It is now preserved as a window into a family’s life in our city’s early years. Calthorpes’ House is divided into areas based on function, with the public rooms grouped at the front of the house, the family’s private rooms are separated by the hall and passage and the domestic work areas are toward the rear of the house. The stained blackwood panelling in the hall is mirrored in the ceiling beams of the dining room and the ceiling of the sitting room. Other timber used in the house has been stained to match, while the walls are rough-rendered and painted. The public rooms are encircled by a plate rail for the display of ornaments. The rooms were very comfortable and fashionable and have altered little since the Calthorpes’ time. The gramophone, pianola, records and bridge cards reflect the family’s entertainment and pastimes. Mrs Calthorpe was a keen bridge player, and many of the items on display were won in bridge competitions. There was a new focus on the science of hygiene in the 1920s which is reflected in the use of easily cleaned surfaces such as tiles and linoleum. The Calthorpes welcomed the new domestic technology of a toaster, iron and fan, but they still relied on an ice chest which required daily supplies of block ice. The stove burned solid fuel, but was later replaced by an electric Early Kooka stove. In the 1920s tradesmen delivered most household supplies to the back door. A tradesman’s safe is located on the back porch in which goods would be placed if the house’s occupants were not at home. On the wall in the pantry is a grocer’s reminder list made of tin. When the Calthorpes first moved to Canberra they brought their live-in maid with them. Her room, between the laundry and kitchen, was located with the working rooms of the house, rather than near the family bedrooms. Although all the women in the family did some housework the maid did the heavy work. The maid, Mary McDonald, was employed from 1927 until the Depression years when the Calthorpes’ felt they could no longer afford to keep her on. The laundry contains the wood-fired copper, three concrete troughs and a hand-wringer; all used for the laborious and time consuming task of washing. Associated tools, including the copper stick, knife for cutting the soap and the blue bag for brightening the wash all survive. This was a key family room, used by Mrs Calthorpe during the day and by Harry Calthorpe as an office in the evening. Memories of the two World Wars decorate the room, including a photo of Harry in uniform and a watercolour of an Egyptian scene. Even the paper blackout blinds, which were compulsory during World War II, survive. Mrs Calthorpe’s collection of family photographs decorate the master bedroom, while Harry Calthorpe’s military dog-tags and service medals are kept in the dressing table drawer. The second bedroom was Del’s, while Dawn’s bedroom contains a collection of children’s toys. The gardens around Calthorpes’ House are typical of their era. The front garden is formal, containing seasonal displays of annuals planted against a backdrop of mature trees and shrubs. The back garden is divided into sections by hedges and fences. The shrubbery with its summerhouse sits in front of the orchard, the vegetable garden and ‘drying green’. The flower gardens were used for both display and picking, and the vegetable gardens provided produce for fresh use and preserving. Behind the woodhouse is a cubby house furnished with a wood stove, chairs and boxes for toys. The building was originally one of many huts built as temporary accommodation for Canberra’s early construction workers. Harry Calthorpe bought the hut to use as a playhouse for his daughters. The garden also contains an air-raid shelter large enough to house two families; a reminder that during World War II the threat of invasion was considered very real.